Hundreds of thousands of Turkish cats roam the metropolis of Istanbul freely. For thousands of years theyve wandered in and out of peoples lives, becoming an essential part of the communities that make the city so rich. Claiming no owners, the cats of Istanbul live between two worlds, neither wild nor tame  and they bring joy and purpose to those people they choose to adopt. In Istanbul, cats are the mirrors to the people, allowing them to reflect on their lives in ways nothing else could. 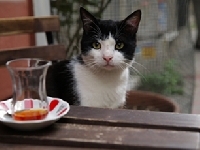 This cat documentary will charm its way into your heart and home as you fall in love with the cats in Istanbul.